One of the highest impact forms of traffic for an online publisher is organic traffic. As new content is created, it is often viewed by many publishers as a set piece that they push off into cyberspace hoping that their social media and regular viewers will engage in the piece positively enough for it rank well in search engines the world over (mainly, Google). Unfortunately, this strategy in of itself excludes one of the most impactful methods for improving overall organic traffic; which is old content that already ranks… just not as well as you would like. So, how do you improve search ranking for old content? One of the common things I see a lot of SEO experts advise publishers to do is track a lot of different forms of data regarding their SERP. Well, fact is, a lot of publishers don’t — and by the time they are thinking about this dynamically — they’ve created a ton of content that isn’t well tracked. The truth is that the most powerful and impactful way for publishers to impact their keyword rankings and increase organic traffic quickly DOES NOT REQUIRE previous data and can be done by almost anyone if they spend an hour every day using a few free/low-cost tools and follow the steps below. Learn how to comprehensively SEO Audit your own website here. I stumbled upon this method years ago when I took over the marketing department for a consulting firm that had loads of awesome content. The problem was, they were in a pretty competitive market, so the vast majority of their content inventory was ranking outside the top 10. 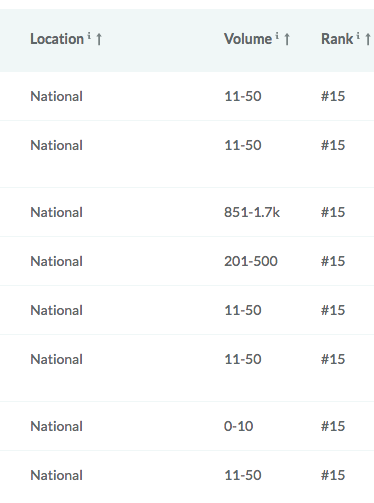 We’re talking hundreds of keywords (and longtail keywords) that were outside the top 10 (some just barely in the top 100). When I ran this site and its content (the respective URL’s for all the content that ranked in Google) through a few common SEO tools I was surprised to find that many pieces of content fell just outside of that valuable page 1 spot on Google. I knew if I could get even just a few of those pieces of content to rank several positions higher, I could probably increase organic traffic for the site as a whole. I wondered how hard this would be. After all, this was a competitive niche market and this content was already well-written and had been carefully optimized and worked on before, right? Using the steps below, I was able to increase rankings for over 5o different keywords and increased organic traffic on that site by approximately 200% month over month in less than 45 days. This also led to an eventual increase in domain authority as well; which helped us get on the front page (result #2) for our most important keyword (above some of the largest competitors in the world). So, here’s how I did it…. This is often the daunting or unappealing part of this whole process. But, I promise it is much easier than you might think and it will empower you to do some really cool stuff with your site. 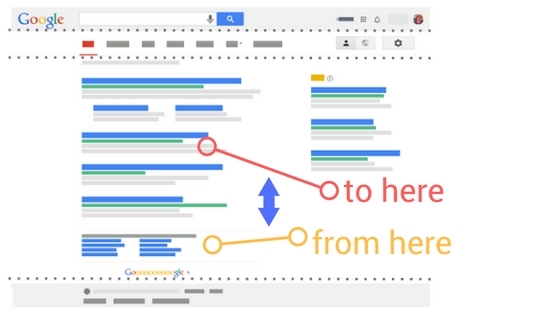 Before you can improve search ranking for old content you have to know what it is right now. There are two really good ways to do this, and one REALY REALLY good way. I’ll give you the best way and reveal the other two shortcuts along the way. This is where tools come into play and you may have to spend a few bucks… I know, I’m sorry. However, I promise you won’t have to pay much and it will totally be worth it if you don’t already have these tools (which you totally might). 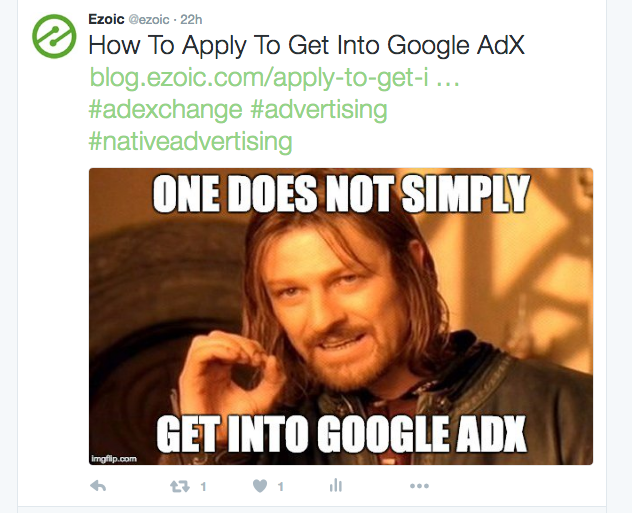 The two I’ve used to do this in the past are Moz and SEMRush, and ideally, you would use both. I can guarantee I’m not a shill for either, in fact, there are other commensurate tools that are good too. I just have accomplished this task using both of these, so I present them as the example. I’m going to write the rest of this article assuming you are going to use both tools to measure keyword and search positions, however, you will be able to see from the examples that it is possible to do with just one or the other. First, I look for my site in SEMRush and look at my organic research. 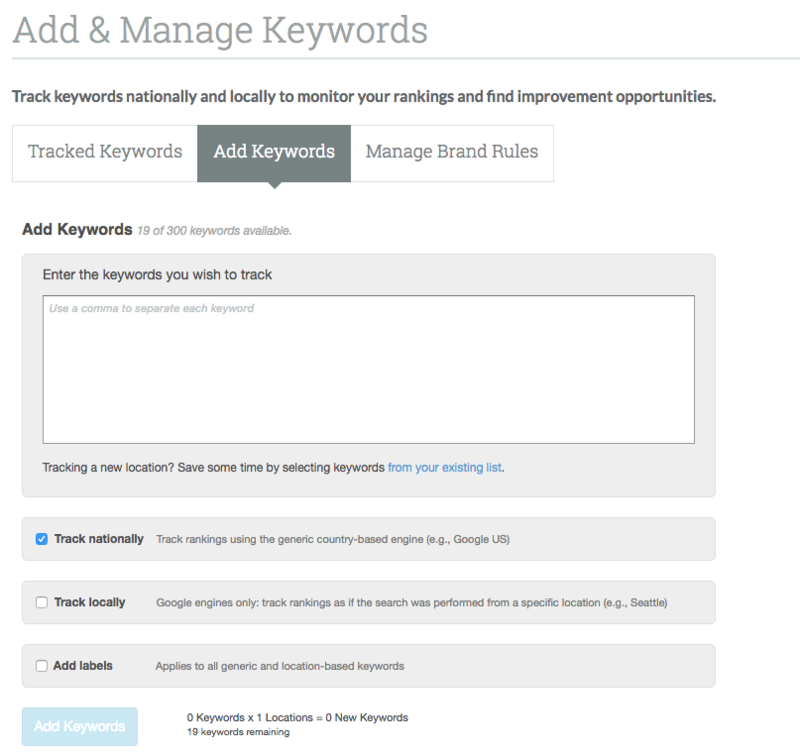 I can then see all the keywords I rank for that have a decent search volume. I can see it easily divided by top 10, 11-20, etc. This is a pretty simple way to see a historical, current, and accurate record of most of my keywords. Next, I export 250 keywords that I think are valuable that rank between 10-50 in the search engine of my choice (in this case Google-US) into a CSV file. I now import my new CSV file into the Moz Keyword Tracker (watch how I do keyword research in detail here). I then add an additional 50 keywords that I have deemed to be high-value (that were not in the 250 I exported from SEMRush). This ensures that high-target longtail terms get tracked and don’t slip through the cracks. 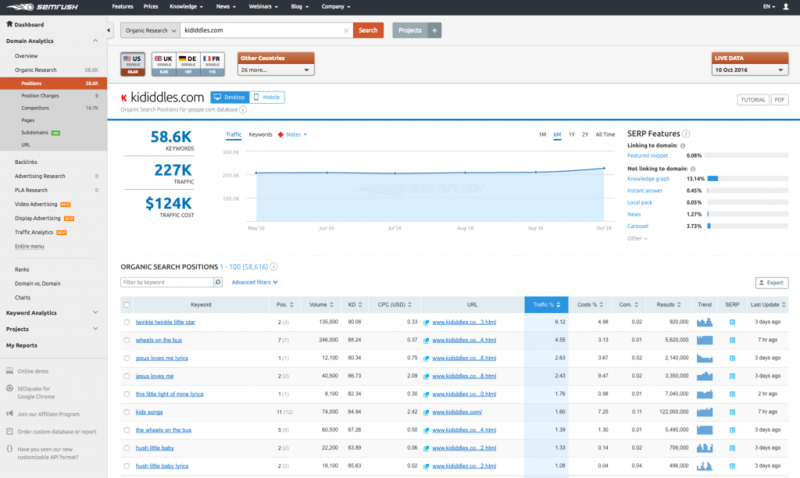 Once you have all 300 keywords entered in Moz, wait for the crawlers to do their work. Then, you can see where you currently stand with your top 300 keywords that — if improved — offer the biggest treasure trove of organic traffic currently available to your site. These 300 keywords are your best bets. The next step will be devoted to what you should be doing at least an hour of every day to impact these 300 to increase organic search ranking for these keywords. The low hanging fruit in all of this is the material just outside of page 1 on Google. That stuff is usually ranking 9-20. Identify what URL’s are associated with these keywords in your new best bets dashboard. You can see above, there are several URL’s here ranked at 15 that have not moved in a few weeks. Most are lower volume, but one is super-high volume. Here’s how you can improve search ranking for those older URL’s. If you’re using WordPress, you should go ahead and install the Yoast Plugin if you haven’t already. What I found in a ton of pages — back when I worked on that site that increased organic traffic by 200% in less than 2 months — was that many of the URL’s were not actually optimized for the keyword they were ranking well for. I am not at all advocating keyword stuffing or anything of the alike; however H2 titles, alt. images, and the content in general was — in many cases — not created for the keyword it ranked for. The basics of white hat SEO best practices are in many cases not fully applied to many of the pages you rank for. Yoast is a great tool that will allow you to throw the keyword you’re trying to improve rankings for into the “focus keyword” box and help you ensure you’re covering SEO best practices on the page. This is where Moz can be of some help too. In many cases, the page may rank well for another keyword and you don’t want to completely redo some of the content etc. to fit a new keyword in. In most of these cases, there is a happy medium to be found. This is where Moz’s page optimization feature is kind of nice. It gives a quick list of ala carte things that can be done to the page to improve basic practices. You can pick and choose from these which ones may or may not be disruptive to previous keywords the page has been optimized for. 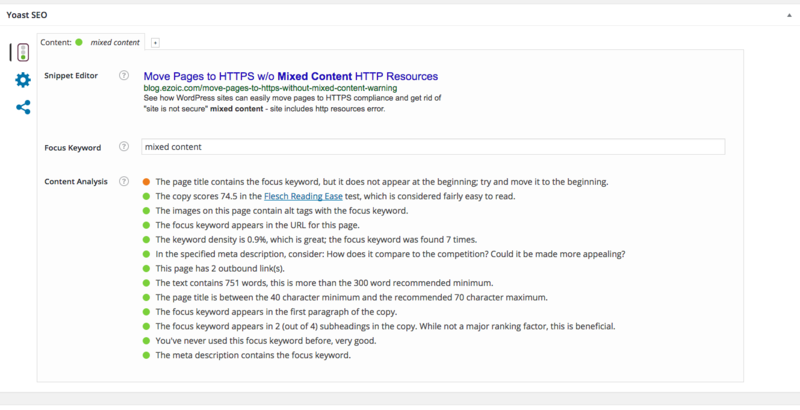 By using a combination of Yoast and Moz you can usually find a handful of small changes that you can make to the contents structure and basis that will improve the widely accepted white hat best practices for page optimization. If the page doesn’t rank well for any other high volume keywords, I will input the target keyword into the Yoast app at the bottom and probably look to change a few H2 settings, image alt tags, and re-write my meta and title descriptions to better reflect what my potential visitor may be really searching for (it could be more or less than this, but this is just an example). If the page does rank for some other keywords, and I don’t want to disrupt their ranking, I will then turn to the Moz page optimization tool for the URL I’m fixing. I’ll see what recommendations I can add to the page without compromising my content. This may be simply adding the actual keyword into the post somewhere (maybe even a title) if it makes sense. I’ll see if I can get the word into the meta description in a fluid manner. I may even add an addendum to some of the content to make sure I can fit the keyword into my article without messing up the article itself. After you’ve done everything humanly possible to improve the content by adhering to SEO best practices relating to that keyword, it’s time to see what else can be done to improve the content. When looking at content retrospectively, I almost always find little details that should be added or updates that should be made to improve the content. Most publishers never go back and improve, modify, or update their content. They wrongfully believe that the content is set and that there will be little to no benefit to doing this. This could not be further from the truth. This is pretty simple and should be kind of fun. 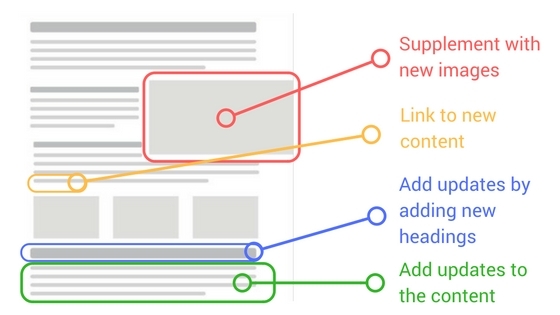 There are few basic things that can almost always be done that will improve the content for your users; which in-turn will help the content rank better (this is what Google says after all). See if you can add any new images that supplement the content. A little secret of good content marketers is that images should be placed evenly down the page to keep readers engaged and scrolling. This behavior is associated with better time on site and better CTR; which are important signals if you want to improve search ranking. Usually, there are updates, details, or information that can be added to the content to make it better. Think about what you could add to this content that might improve its value to readers. This should include a new header to go along with this new content. Another thing publishers often forget to do with older content is going back and linking to their new content (where relevant). Discover where in this content you could anchor links back to some of your newer content (this will increase CTR’s). Having these links at the top of the page is proven to get more clicks. A lot of publishers only include them at the end. These simple tips —when adhered to diligently — almost always generates a better user response; thus improving quality metrics for the page. 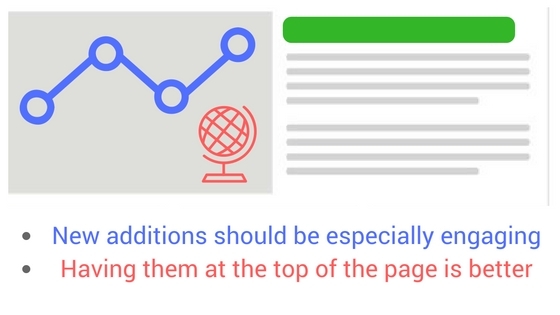 Why this works: Improving the content this way will almost always ensure that all new visitors to this page spend a little more time on the page and it will increase the likelihood of them scrolling through and exploring other pages. This means the quality metrics will get a boost over previous metrics. This is a signal to Google — and other search engines — to improve search ranking for that content. 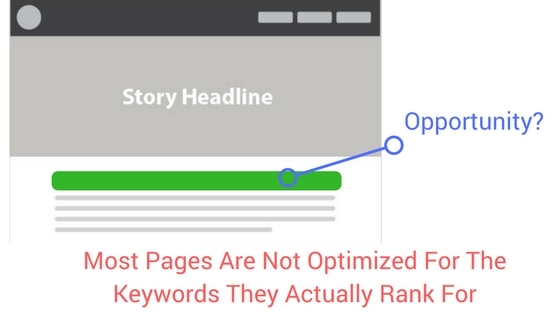 The next step in having this content improve in search ranking quickly is exposing your newly doctored content to users so that Google knows that the quality metrics are now better on this page and it’s ranking should be improved. Most publishers will find that 2-3 of these networks work better with their audience than others. When sharing, try including a new status title that will entice visitors differently than previous shares. Also, maybe add a new image along with the post to get more clicks. What if you don’t have a big social media following? Fear not! If you don’t have a large social media following there is still another way you can achieve your goals of exposing the content to more people (however, I would share it on whatever social media you can regardless of impact). There are a number of good, free, completely harmless content curation sites that will allow you to get at least a handful of clicks; which in many cases may be all you need. *Note: Reddit is a close community. If your content is relevant to a sub-Reddit feel free to share, but beware “blog-spamming”. It could ruin this network for you for the long term. 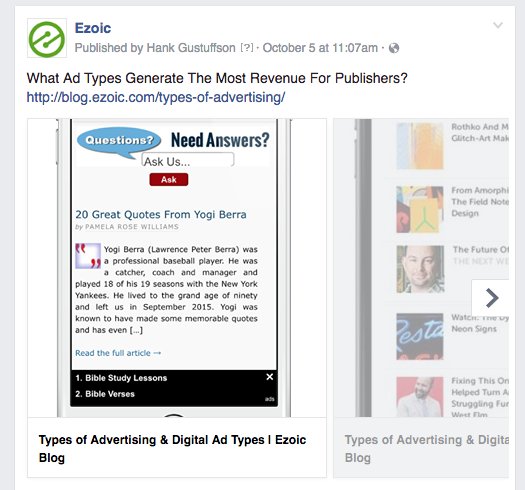 Between social media and these content curation resources, you should be able to get a decent amount of visitors to this newly updated content. Looking for search ranking improvements? Now its time to sit back and keep your fingers crossed. Most of the time results are fairly quick. Within 7-10 days the content should begin to improve in search rankings. Sometimes it will take longer, but rarely does it take more than a month. In almost every case there will be some kind of improvement. It may not be first-page improvement, but it will be an improvement. This is a good sign. If your content had a long ways to go (maybe it was previously ranked at 51 and is now at 22), there is still a very good chance it will continue to improve over time. Continued sharing on networks like Twitter and Instagram can help with this. 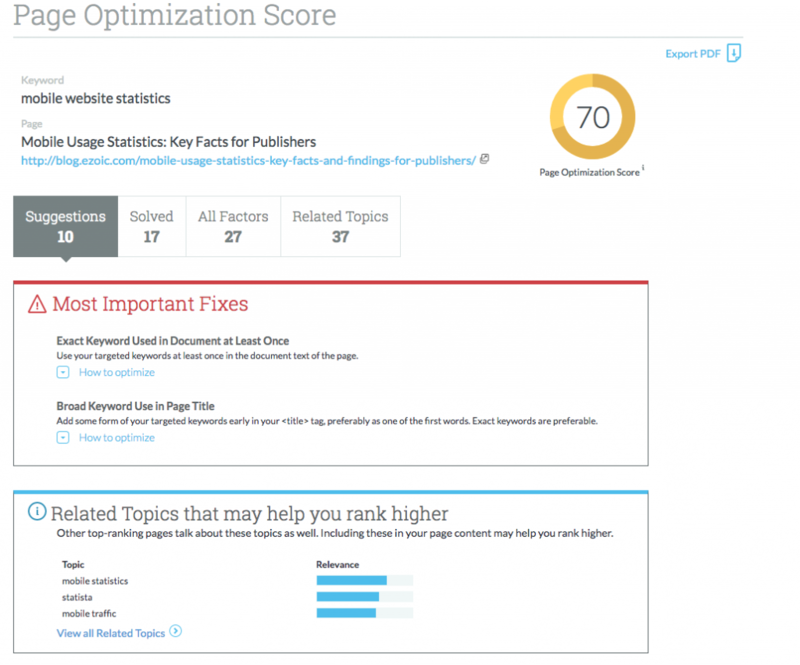 You can measure the results by going back and reviewing the Moz dashboard that was set up earlier. 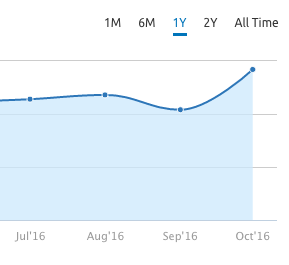 You can also look at this in SEMRush by looking at keyword positions week over week. If not, I GIVE EVEN MORE ADVICE ON HOW TO DO THIS HERE. I’ve done this for sites dozens of times and every single time it works. It is a proven white hat strategy that yields major results. If you can improve search ranking for your site there is a good chance that the traffic increases you experience will result in greater ad revenue and improve EPMV. This is a win-win. What are you waiting for? Interested in learning more About Getting Content To Rank? Try My Seminar Below.